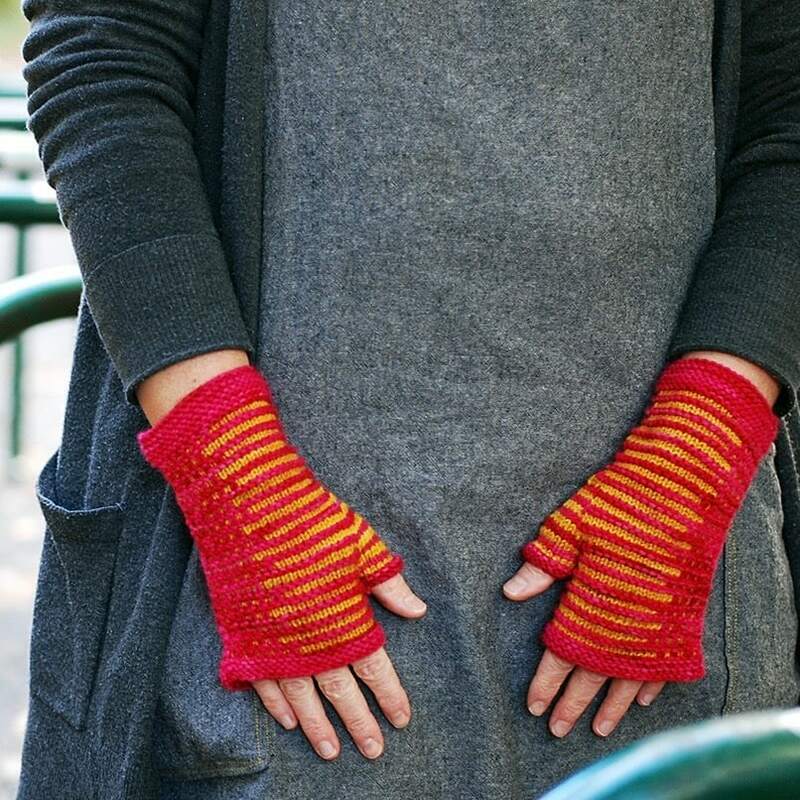 These mitts actually have many points of symmetry — the two mitts are symmetrical to each other; the point at which you join the circumference is a point of symmetry; and the exact middle of the thumb gusset is a point of symmetry. This also means that the left mitt is the right mitt is the left mitt, which makes getting dressed much much easier. Finished Measurements: Small [medium/large]: 6.5 [7.5]” circumference at wrist, 8 [8.5]” tall, from cast-on edge to top of hand. Mitts are shown in medium/large size. Yarn: approximately 140  yards total sport-DK weight yarn, in two colors. I used Blue Moon Fiber Arts Gaea Sport, colorways Lover’s Leap (HOT pink, color A, 90  yards) & Ochroid (yellow, color B, 50  yards). Needles: US4/3.5mm needles, for small-circumference knitting, or size to get gauge. Gauge: 22 sts = 4″/10 cm in stockinette stitch in the round, measured after blocking.